If you looked at my previous page on the Cyonics/Uniphase SLT-30 you know’ll know what this one looks like. It’s the same casing and tube and starter, but with different optics on the output coupler. At some point Uniphase stripped the Cyonics name from their products, but of course the design is the same. The Uniphase 2214-40 MLAM is a multi-line Argon-Ion laser head. 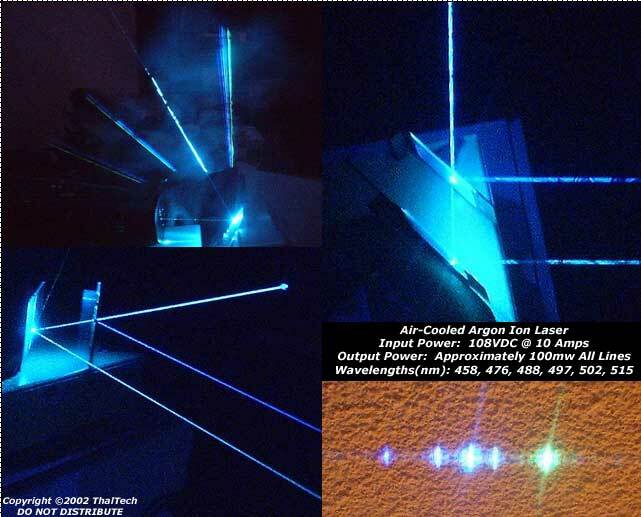 It is capable of producing 6 seperate lasing line which results in six different colored beams. There are no photos of this laser head as it looks pretty much like the one in the SLT-30 page, and I have no higher quality versions of it. This laser head was rated to produce an average of 40mw throughout it’s lifespan, though many of these lasers produced more than that when new. This particular head was brand new when I bought it. I really wanted something high quality and in good condition to experiement with and I was offered an excellent deal on two of these laser heads. So excellent in fact I passed one on to a ‘laser buddy’ and kept this one for myself. 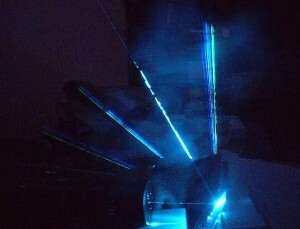 I powered this using the modified SG-IY power supply I had built using the schematics from Sam’s Laser FAQ. I don’t have much more to say about this laser, which was not covered in the SLT-30 page, so I will leave you with some output photos to enjoy.